The 41 metre motor yacht Silver Cloud, listed for sale by Michael Rafferty at IYC in Palm Beach, Florida, has had a major price reduction of $4,500,000. Built by German yard Abeking & Rasmussen to an in-house design, Silver Cloud was delivered in 2008 as a SWATH (small waterplane area twin hull) model and went on to win a prestigious World Superyacht Award in 2009. Accommodation is for 12 guests in five cabins including a master suite, two doubles with king sized beds, two doubles with queen sized beds and a twin with Pullman berths. All cabins aboard this yacht for sale have entertainment centres, LED television screens and en suite bathroom facilities. The main deck saloon, designed by Michael Kirschstein, has panoramic views via large windows, two lounge areas and two dining areas, fostering an air of intimacy between guests. Powered sliding glass doors lead out to the aft deck offering every facility for al fresco entertainment and dining. The sky lounge doubles as a media room, with four powered lounge chairs and a 65 inch LED television screen that lowers from the ceiling, affording guests a comfortable space for relaxed viewing. 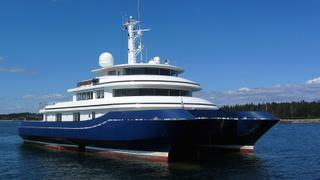 Additional features include an elevator, spa pool and a large helicopter deck. Twin 1,100hp Caterpillar engines give her a range of 4,000 nautical miles at 10 knots and she is fitted with zero speed stabilisers. Silver Cloud is now asking $21,000,000.